We can’t believe Considering You is 1! We started scheming about this blog over a year ago and we still absolutely love it. It’s been a way for us to stay accountable, meet like-minded people and share everything we learn! We hope we’ve made an impact on your lives and we’re excited to see it continue to grow. Allie got so excited last night that she made grain-free donuts! Recipe here. Sadly, we haven’t seen each other since last January so that needs to change this year. Mary is in Tennessee and Allie lives in Ohio but our busy schedules have made it difficult to get together and collaborate in person again. As a huge thank you for supporting/reading/commenting – we’re hosting a birthday giveaway with some of our favorite products. We don’t host giveaways based on donations. We usually purchase most of the items ourselves (we don’t make money blogging) so know that you’re getting the best! We’ll choose a winner on Saturday, February 15th and will announce it here (and will email the winner). Just in time for Valentine’s Day. We love you all! Our friend Liz’s (from Cave Girl Eats) new book comes out Feb 25th! You’ll receive a free copy. We couldn’t be more excited about this one! Bearded Brothers’ did donate these awesome energy bars! Perfect for when you’re on the go. A PackIt freezable lunch bag. It stays cold all day too! Now you’ll never find yourself somewhere without a healthy option. A 100% silk pillowcase. It does wonders for your skin AND hair. A glass water bottle from Life Factory. Stay hydrated all day! I’ve loved so many of your posts… Would enjoy seeing more recipes and meal inspirations. I can’t believe it has been a year! I love the blog! So many good ideas and tips. Happy birthday to two of the most beautiful women I know! Thanks for all your inspiration! Aw thanks Sim. We love YOU! Happy Birthday!! Love the site! Love your posts so far! Looking forward to your second year. Happy blogiverssary! I’m glad you are writing here again. Thanks Rachel. We love your blog!! Great products! I found this blog through Allie’s and love it. You’ve definitely been a resource for me for healthier living! As a coffee addict, I’d love to see more discussion about coffee, caffeine, cortisol, sleep, stress. Stuff like that. Oh good idea. Thanks Mike! Always so excited to read your content (and see the accompanying photos!). Keep up the lovely work. Aw thanks Ashley. We are glad you love it. Love your blog, of course. You guys are such an inspiration. I would love to read more about how to stay gluten free when eating out and also how even gluten in moderation can help. Ways to have that discussion without feeling trendy or absolutist. xoxo! We totally agree. We are excited to start sharing! I’d love to see more recipes! Great giveaway!! I’d love to see more posts about living healthy and what products/routines to keep up with. I’d love to see more natural skin care/hair care tips and products! Great! Thanks Alyssa! We love this topic! Totally get this. Thanks for the great suggestion! Oh love this!! Thanks Hope! Learning so much reading your posts!! Thank you! And, HAPPY BIRTHDAY!! I totally agree with Paige – spending not a lot of time in the kitchen while still eating healthy. Once I get in the groove of eating healthy meals, I don’t mind it; however, I hate spending a full day in the kitchen prepping! Who doesn’t love new recipes?! That’s the fun of cooking! When it’s bad…it’s usually really bad, haha. But when it’s good, no leftovers! I would love to see more recipes and maybe some ideas for new ways to be active… out of the box ways to get some fitness in! Great suggestions! We love out-of-the-box ideas! Love that Liz’s book is in this giveaway. She’s my hero. I’ve loved following Considering You since it started — it’s a wonderful resource! I’d love to see some articles on how to staying healthy on the go (Bolthouse Farms vs Naked Juice, how to make healthier choices at restaurants, airport snacks to look for, etc). Such a great giveaway! I keep reading that silk pillowcases can make a huge difference. Aw thank you Michelle! And we love that bottle too! Congrats on the 1-year! 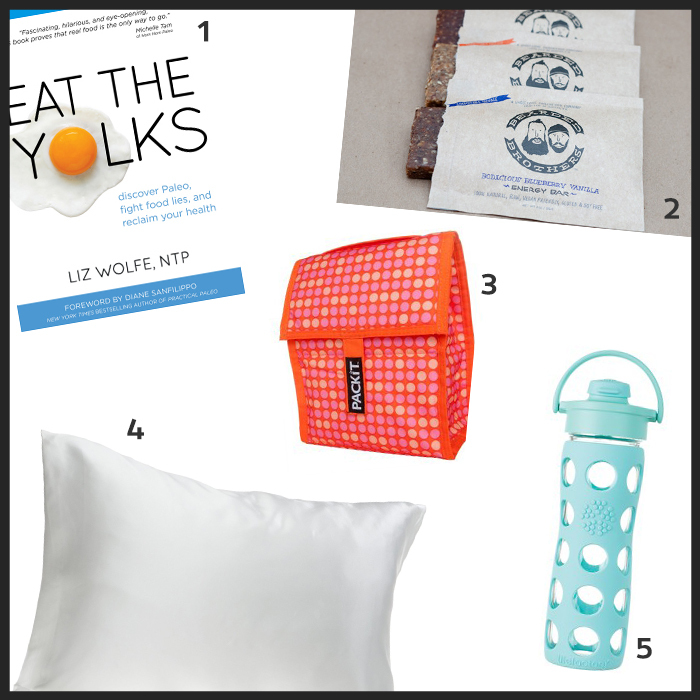 These look like great products – I’ve been eying the Eat The Yolks book for a little bit. I’ve really enjoyed follow your blog, lots of helpful pieces. Keep up the good work and I hope you get a chance to collaborate in person again soon! Thanks Jen!! We love your support. The book is amazing. We’re excited to send one out before the release! Thanks so much for this! I’d love to see you ladies write more about digestive wellness – something I think a lot of us are concerned about. Cheers! Great to know! Thanks Ellen! I want more fitness info, can never get enough. Keep up the great work ladies. I love your blog! Very interesting! What kind of crafts? Health related? Thanks for your support! Happy Valentine’s Day! I would like to see more great recipes and possibly even some interviews of other health related personalities! Any idea if you could get Jillian Michaels to talk to you vwhen she is in Columbus in March? Speaking of the BL, what are your thoughts on the recent winner of the biggest loser season? Healthy or too much?